MLB 3 Pack Contour Headcovers (Select Teams Available) - $29.95 - GolfersEdgeOnline.com - Best Golf Equipment On The Web! Keep your clubs protected with team spirit by using the Team Golf MLB 3-Pack Contoured Headcovers. 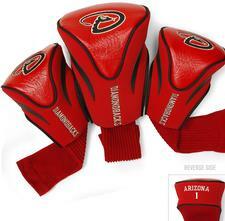 Each headcover comes adorned with the team logo, colors and wordmark, showing team dedication. The nylon sock on each protects the shafts from damage, and the buffalo vinyl and synthetic suede material keep them clean and protected on and off the course. Each comes numbered 1,3 and X, and number 1 fits all oversized drivers. If you have any more questions about the MLB 3 Pack Contour Headcovers (Select Teams Available); do not see the model you are looking for; need custom options; or prefer to not purchase online, then please call us at (630) 656-1291.